HAL Trade Apprentices Training Notification 2018: Hindustan Aeronautics Limited, Korwa has been invited applications from the Ex-ITI (NCVT) candidates for Trade Apprenticeship training through Technical Training Institute, HAL for the year of 2018-2019. Apprenticeship Training will be provided in the ITI trades of Fitter, Turner, PASAA, Welder, Machinist, Electrician, Welder (Gas & Electric), Carpenter, Turner, Mechanic Motor Vehicle, Draughtsman Mechanical, Electronics Mechanic, Painter and PASAA. 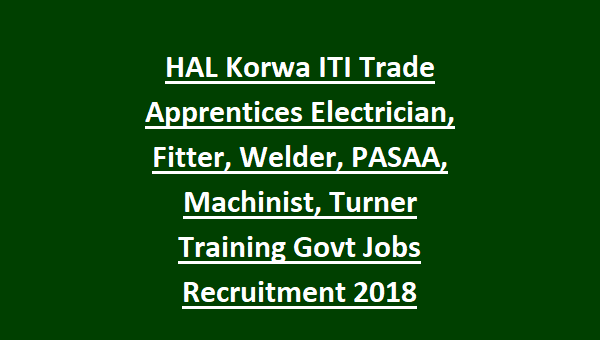 There are 121 trainee vacancies in available in this HAL Korwa Apprenticeship Program 2018. HAL is a navarathna PSU company which is running under the outline of the government of India ministry of defense. Eligible candidates can registered at www.apprenticeship.gov.in for this HAL Korwa Apprenticeship Training from 10-10-2018 to 30-09-2018. Selection for this HAL recruitment will be based on the merit in academic qualifications percentage only. 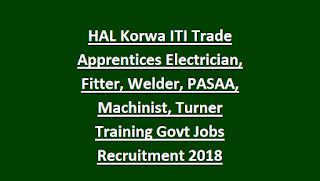 For more details regarding this HAL Korwa ITI Trade Apprenticeship Program for the trades of Electrician, Fitter, Welder, PASAA, Machinist, Turner related information is given below. Click here for official notification of Hindustan Aeronautics Limited Korwa. Last date to submit the application form via Email to HAL Korwa is 30-10-2018. There are 121 vacancies available in Hindustan Aeronautics Limited, Korwa. Educational Qualification for this Trade Apprentices recruitment of HAL is the candidate must have qualified ITI in their Respective trades with SSC qualification. Candidates who are passed Craftsman training under NCVT scheme from recognized ITI's of Karnataka State. Minimum age limit for all the candidates is 18 years. Maximum age limit for general candidates is 27, for BC 30 years, fro SC/ST 32 years and for the PHC is 37 years. For first year Rs 7618.5/- per month will be given and for the second year Rs. 7618.5/- per month will be given. Selection for this Hindustan Aeronautics Limited will be held based on marks obtained in academic qualifications. The eligible candidates can register online at apprenticeship.gov.in website. Send the application form through email to HAL Korwa along with all the required documents. Candidates must have mention Apprenticeship Program registration on application form for Hindustan Aeronautics Limited Korwa Trade Apprentice Program. Note: Candidates who have passed Apprenticeship under Centre of Excellence (COE) scheme need not apply. Download official notification and application for, for HAL Trade Apprenticeship Program. Please share this HAL Korwa Trade Apprentices Training Recruitment 2018 article to your lovable friends through social networking sites.